Port Carling is a scenic location in the "cottage country" of Muskoka. Nestled between Silver Lake, Mirror Lake, and Lake Rousseau, Port Carling is home to various charming lakefront resorts such as the Sherwood Inn, Shamrock Lodge, and the Lake Joseph Golf Club. These resorts are picture-perfect locales for wedding photography due to the breathtaking beauty of the virtually untouched Ontario landscape. Port Carling is only an hour and a half from the city of Barrie but it retains a timeless, natural beauty that provides gorgeous, once in a lifetime photos. This photo is of the beautiful bride and groom who are located in the centre of the photo. The bride and groom's embrace is encapsulated by the vast natural landscape. 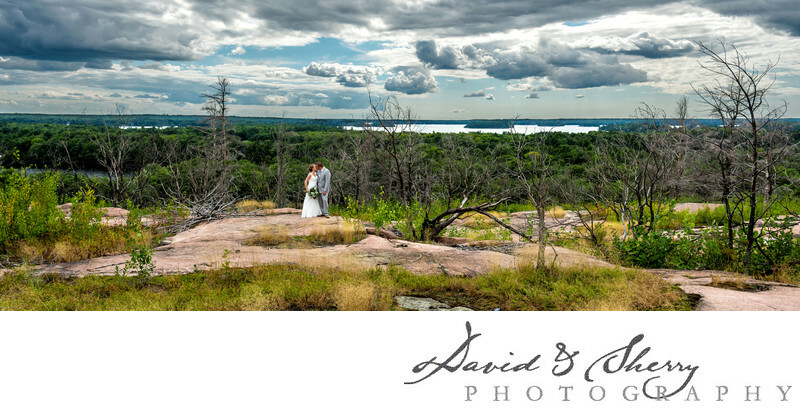 The primary elements of the photo is the bride and groom which are standing on top of a natural stone alter which is overlooking the glassy Muskoka Lakes. The Port Carling countryside seems to stretch on forever into the distance under a cloudy sky and into sea of luscious green forests and shimmering lakes. The purpose behind the staging of the position of the bride and groom in this photo is contrasted to the natural landscape and gives a feeling of resoluteness of the couple's embrace against the vastness of the world.